Camp Blankets are worn around camp and particularly around the campfire. They may double as a sleeping blanket or pillow. They are not carried on a hike camp. Camp Blankets are a history, a display of your scouting life- what you have done, where you have been and who you have met. Camp Blankets are not part of the kit, they are not uniform and they are not always blankets. The guiding principles, although unspoken, may be practicality, longevity and that all facets have a connection with the owner. 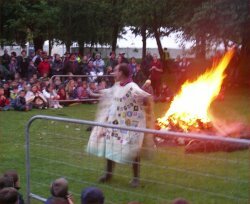 Camp blankets can be cut as ponchos, capes, cloaks, coats, waistcoats blankets or as you will. They may be fastened, hooded, or otherwise individualised. Duplicates of current scarves, from previous groups, or celebrations such as the centenary 'wizard stars' one. - buttons, button knots, toggles, ties or cloak pins. Yachting cord comes in many colour mixes. Some use silhouettes of patrol emblems, maps identifying camps, mountains climbed, courses sailed, etc. Sew any cut edges and add a softer binding to neck holes in contrasting colours. To add unique items not available in badge form. The layout of badges, scarves etc. is entirely up to you. By shape, colour, size, date, section; to make a picture; to fill a map…. Do get the owner to be involved in the design and sew at least part of each badge. It will then be more wholly theirs. Do use wool – synthetics will often melt into holes or worse if they catch a spark. Do invite questions in the design. You can spell out your Group, District, County, etc. but this may answer all the questions and stifle the first approach. Don’t use Velcro – no one wants a ‘scrrrrrrip’ of Velcro when the song is ‘sad and low’ and it lacks elegance and individuality. Do go for mid to dark colours as campfires can be unclean. Do use a close stitch for embroidery or it will snag readily. Don’t use metal badges or pins if you intend it to double for sleeping. You may wish to contrive a removable fastening to avoid an uncomfortable night or for washing. Don’t use fiddly fastenings; cold hands and dark tents won’t appreciate the choice. Do plan for growth (if applicable). This may also dictate style – ponchos may allow greater growth than a ‘coat style’. Don’t worry if your badges fade to illegibility. Fading implies age, age implies more history, the more history the better. Do feel free to fill the starting blank with the block colour of a scarf or silhouette – it will take forever to fill with Activity Badges. Purely as an example and by no means an exemplar my camp blanket is a simple poncho. It is an old grey blanket bound at the neck with gold velvet. It has a silhouette of the British Isles with camps marked across the back. 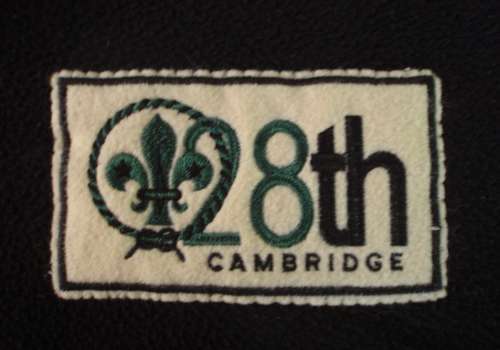 The front has badges of Cubs or rather Wolf Cubs (no Beavers then), Scouts, and Ventures, camps and other trips, swimming awards, first aid… These are laid out in a pattern with regard to shape and, secondarily, colour. It has not been updated for 30 years, having been styled by my mother, but has been worn recently, in anticipation of his own, by my son. So, time for a new one? I am, after all, fully grown now. This time I will do all the sewing.